Yes, the Chiffon Chicken Pie won out, after a neck-and-neck race with both the Norway Strudel and the Mock Chicken Legs. I honestly don’t know whether to feel relieved or horrified. 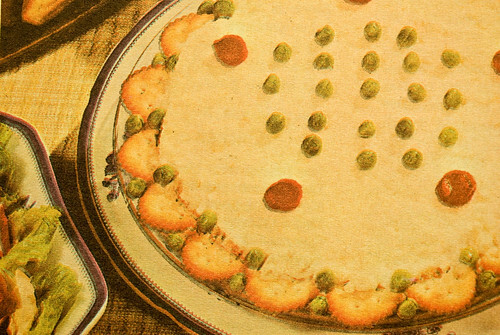 So any way, now I need to go buy some Ritz crackers and pimientos (I seem to have an unopened box of gelatin already), and we’ll make this either later this week or next (we’ve been eating a lot of chicken, I might need a slight vacation before undertaking the pie). Say, if anyone is still morbidly curious about the other regrettable dishes, I’d be happy to supply you with the recipes for you to try them yourself. No problem! Yay! That’s the one I voted for! 😛 Can’t wait to see your result!